Audi has released their latest TT RS Coupe and Roadster with a new face and extra power. If you head on down to your favourite Audi dealership, you'll find the shiny new Audi TT RS Coupe and Roadster on the showroom floor. The first thing you'll notice is that the new models appear to have visited a gym, with a more sculpted, masculine appearance. The front bumper is deeper set with an RS-specific black honeycomb grille and a gloss-black front splitter propping it all up. The side skirts are wider and lead you along the flanks to a revised rear bumper, which also sports a black RS diffuser housing twin exhausts, and there's a choice of either 19- or 20-inch wheels. 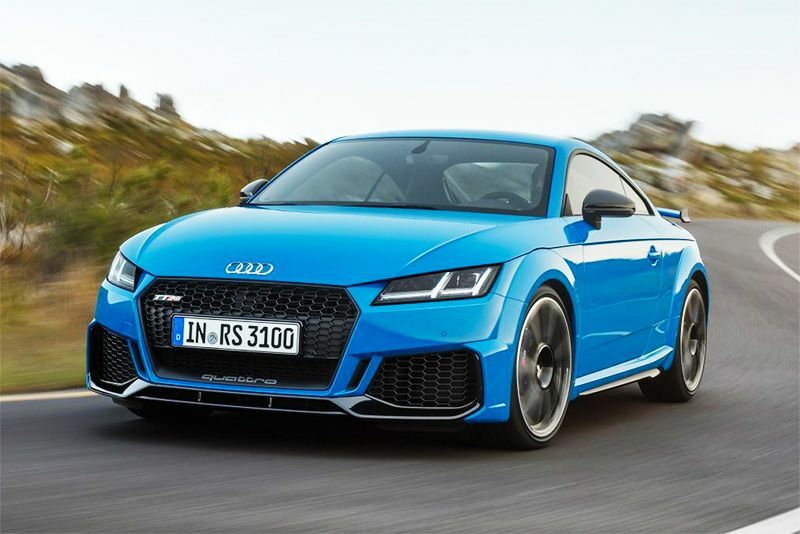 The Audi TT RS is powered by a 395bhp 2.5-litre turbocharged five-cylinder engine that pushes out 480Nm of torque – the same engine as the previous model, just with more horses. The seven-speed DSG automatic gearbox and all-wheel-drive system also remain and, according to Audi, help propel the car from 0-62mph in 3.7 seconds. The TT RS will reach an electronically limited 155mph but, if that won't do, clients can opt to remove the limiter and reach 174mph. There's the 'Driver Select' system that adjusts things in the engine to suit your style and, as is the case so often these days, the driver can also alter the noise that comes from the exhaust too. To separate the RS further from its lesser siblings include revisions to the chassis, with four options for the driver in Audi's chassis control system. As standard, there's stiffer sports suspension, a new adaptive steering setup and perforated, vented disks up front while adaptive dampers are optional extras. Climb into the Alcantara-trimmed sports seats and you're greeted with a leather RS steering wheel and a digital gauge assemblage that measures in at 12.3-inches. There's something called 'shift light' while the obligatory RS badges adorn the door sills, paddle shifters and floor mats. Reach a bit deeper into your pockets and you can add the RS design package to your car which adds either red or blue highlights to the air-vents, seatbelts and door trim. There's also satellite navigation with voice recognition and Audi's smartphone interface for content streaming from a USB connected mobile. You also get support for a roaming Wi-Fi hotspot and Bang & Olufsen's 680W sound system takes care of the audio duty. The new Audi TT RS goes on sale this month and prices for the Coupe and Roadster start from around £60,000 and £62,000 respectively.